Project Financials -- See separate project financials website here. Project Status -- On-Track, Underway -- The Preliminary Design Report for the Fry Creek Restoration & Flood Reduction project was completed in August 2017. The Report identifies design and phasing alternatives for the lower creek system. Based on the Report's findings, the first phase of the project was selected to be the creek between Simpson Avenue and the railroad tracks. Final design of the first phase is currently underway. Funding for construction ($2.215 million) is included in the State's 2017-2019 biennium capital budget through the Washington Coast Restoration Initiative. Background -- Fry Creek passes through developed urban areas of Aberdeen and Hoquiam before discharging to Grays Harbor. The creek channel has been filled in and constricted over time as the cities have developed, and today it is generally a narrow channel passing through many culverts and under roadway crossings. During high rainfall events, the flow exceeds the capacity of the channel and the creek floods adjacent urban residential and commercial areas, affecting homes, businesses, roadways, and vital operations such as the Grays Harbor PUD and Pacific Care and Rehabilitation Center. In addition to direct flooding, city storm sewers that are hydraulically connected to the creek surcharge when it floods, contributing to significant flooding in low-lying areas not immediately adjacent to the creek such as Cherry Street farther east in the City of Aberdeen. The Cities of Aberdeen and Hoquiam developed a comprehensive flood risk master plan – the “Timberworks Master Plan” – in 2016. The Master Plan identifies restoration and flood reduction measures for Fry Creek. Aberdeen is continuing the work begun by the Master Plan by restoring Fry Creek and reducing flooding by improving conveyance, storage, and outfall conditions in the creek system. Additional goals include habitat restoration and improved public access to Fry Creek. 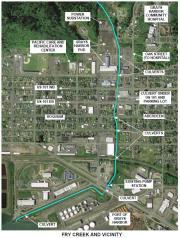 The project will benefit the City of Aberdeen, City of Hoquiam, Grays Harbor PUD, Pacific Care and Rehabilitation Center, and many others. Flood Hazard Reduction Benefits -- Project will benefit the Community through improved management of flood waters from Fry Creek thereby increasing property values, improving use of limited Public Works resources, improving habitat, and improving recreational amenities.